What if happiness was contagious? A viral kind of thing. Latest research shows that happiness IS contagious. And that one small act of kindness can not only spread happiness to those 2 people, but to the friends of friends of both those people. How cool is that?! Creating happiness is also a skill that can be learnt, despite being hard to define – as we’ll each have our own unique definitions. One thing it is not, is a final destination to be arrived at. It is something we all seek continuously, yet we don’t always achieve; and there are times when we can feel decidedly unhappy. The comfort zone sometimes gets a bad rap for being a place where we don’t escape much. It can be a safe haven for security and safety where good things and good feelings run freely, where we don’t have to extend ourselves or risk too much embarrassment. Yet life isn’t always so grand in the comfort zone and in fact, there is often a dark shadow lurking like a mysterious character in your favourite horror film. You don’t always see it and life can go on around it but there are clear times you can sense its presence. On some level, in some way, you’ve become comfortable with what makes you uncomfortable. You might be uncomfortable with your body but have gotten used to the feeling of tight jeans or feeling bloated. Perhaps you are regularly frustrated with your boss or colleagues and have had to learn to not only endure their daily ineptitude but endure your own daily discontent. Is your bank account far from where you want it to be leaving you to accept regular overdrafts rather than putting in a smart saving plan or find a way to earn more income while reducing costs. The more you allow yourself to bear with situations and things that take your further away from your goals and dreams, the more you train yourself to settle. Settle for less than you’re capable of and way less than you deserve. Resign yourself to less fulfilment. Learn to stomach less happiness. So right now is the right time to face up to what’s no longer worth putting up with. It’s time to raise the standards of what is acceptable for you. It may not be easy to change your experience overnight but you can change your perspective immediately. As is usually the case, big change starts with small steps. Find something today to give you a small victory and take a stance for your standards. Make a better, more nourishing food choice. Get off the bus early and walk a little further. Put a little money into your savings account each week. Be confident in having a crucial conversation. And all the while, start to embrace being uncomfortable again. You deserve it and you’ll be grateful you did. Leave us a comment and share what you would like to take a stance for in your life. What standards would you like to raise? And how can we help you to do just that? We’d love to hear from you. Watching the Paralympics on TV yesterday, I was amazed by the sheer guts of Oscar Pistorius and Alan Oliveira as they turbo-charged their way around the track in the 200m final. He may have had his first defeat in nine years (“Your blades are long than mine!”) but it was still an impressive performance by the South African, who looked certain to win, until the Brazilian breezed past him in the last few metres. These Paralympians are beyond inspirational… from Ellie Simmonds MBE winning another Gold in the swimming – the shortest competitor in the pool and yet the fastest – to Natasha Baker’s superb podium-winning performance in the dressage, they are all incredible examples of undefeated human spirit. Despite physical limitations, these athletes have powered their way into our hearts and the record books. We all have days when we feel like throwing in the towel. Oddly most often when we are closest to achieving our goal. When you feel like giving up – take a day off, get yourself in nature, shift your focus and change your thoughts. But never, ever give up! The Olympians and Paralympians we’ve been watching the last few weeks weren’t born natural champions. Sure they are gifted, but it’s the years of consistent training and dedication to following their hearts and their passion that has brought them to London 2012. They’ve created training structures that serve them. So do the same. Work out your own realistic schedule of baby steps that can take you from amateur to champion. The following quote had a massive impact on me when I first saw it: “If you don’t know where you’re going, how will you know when you get there?” Good question! It’s important to have our desired end result in mind – right from the get-go. We can be flexible too, the end result might change a little over time, but our subconscious works best if we give it an end game image. So if you’re lacking direction in one area you want results in, take time out, be honest with yourself and decide on your final destination. It works. All the athletes at London 2012 are fully focused on the task in hand. They’re not going to allow any petty distractions from achieving what they came here to do – win a medal. So look at your own life and make a list of all the distractions you’ve created to take your eye off the prize. What you focus on – ie your thoughts – are creating your reality. If you are focusing on lack and confusion, you’ll get more of the same. If you focus on what you want – NOT what you don’t want – you’ll attract it (with some daily pro-active action, too of course!). We’d love to hear how you’ve been inspired by these amazing Olympians. Share your comments below, or visit us at facebook. If we consider a past experience with the wisdom we currently have, it gives us the opportunity to reframe it – in hindsight and with hindsight. Looking at things in hindsight doesn’t just have to be about slapping our own wrists for things gone wrong. This amazing function of our brain allows us to transform a long-ago embarrassing situation into a funny reminiscence. A fear-filled time into evidence of how brave we can be even when we don’t feel like it. Or a difficult time of challenge into an inspirational story to share or a character-defining experience. Our perspective gives us the ability to choose a new way of viewing these memories. Join Sam in this short YouTube video as she shares why looking at things in hindsight can be a powerful tool for the future, as well as the past. For more on Hindsight, including a personal example, check out this earlier blog post. This is the first video posted in our new YouTube channel – please do leave any comments below, or visit our YouTube Channel and subscribe for further video updates. Your personality is what makes you different from everyone else. It’s made up of your emotions, feelings, thoughts, behaviours and attitudes. Not everyone has a “winning” personality though, which is why a lot of people find it hard to accept who they are. This inner conflict and lack of self-acceptance makes it hard for many of us to embrace our true personalities. It is good to change for the better, but before you can change or improve your personality, you must first accept your personality. Just as you are. Changing yourself, without admitting and embracing the negative facets of your personality will only cause you stress, decrease your self-confidence and even cause depression. You can make things easier for yourself just by embracing your unique personality. It boosts confidence – Many people today often lack confidence. Not only are they unhappy with what they do, but at the same time, they end up being unhappy with who they are. According to studies, as much as 50% of workers are unhappy with their jobs. This situation is also made worse by what society perceives to be the proper or ideal personality. The first step in gaining more confidence is to embrace your personality, and not allow other people to dictate how you should or shouldn’t be. It makes you happy – Loving who you are, with all your good attitudes and shortcomings will bring you happiness. Don’t feel bad about things and attitudes you don’t have, as this mindset is counter-productive. Embrace what you do have and be proud of it. It minimizes anxiety and jealousy – Part of the anxiety that many people feel is caused by the lack of confidence they have with themselves. Once you begin to accept who you are, you will be more confident about yourself, and you’ll begin to stop comparing yourself to others. If you focus on what makes you unique and special, you won’t feel the need to compare yourself to other people. It helps you reach your goals – When you know what your strengths are, and what you are capable of, then you can achieve success. Knowing what you can do helps you reach your goals. If you don’t believe in yourself, you will spend too much time feeling sorry for yourself, which won’t help you accomplish anything. It helps you mature – Accepting your personality is a sign of growing up and maturity. Not all adults are mature enough to embrace all parts of their character. But when they do, they become wiser and more successful in life. Everyone has something about themselves that they want to change. You may not realise it, but changing things about yourself isn’t always the solution to achieving happiness and confidence. The trick to being truly happy is embracing your unique personality. What about you? Are you embracing your personality? What part of your character do you want to change? If you have taken any steps to start accepting yourself, let me know what you did and how it worked for you. Yesterday I attended the funeral of a friend, and as the crematorium overflowed – there must have been about 40 or 50 of us standing after all the seats were taken – I am sure his answers to these questions were etched in our tears and our hearts. At only 42, and leaving behind a beloved wife and gorgeous 5 year old daughter, Lindz left the world far too soon. He had definitely lived, as was reflected in all the humorous stories we shared about him at the wake; he had definitely loved, and been loved by many; and he mattered – as evidenced by so many of us (and many more who couldn’t make it) who had wanted to be there to celebrate his life and say our goodbyes to this unique character. It has really reminded me that we never know when our number is up. We might be given a lot of notice, or we might be given none at all. Lindz had a few short months: he stayed courageous, kept his good humour and was as true to himself as he could be during those last days. I wonder if we can all say the same thing about our own lives? What we think we want from life is subject to change. It can evolve slowly, shift dramatically or burn brightly in our heart and minds. Being authentic, and by that I mean being yourself in a relationship is absolutely essential. For you and your partner. Yet many of us tread on eggshells around other people; trying to please, giving them what we think they want, and ending up tired, frustrated and often angry. And often blaming the other person for our lack of courage to be fully present and fully ourselves. This fundamental lack of self-confidence means that we often attract others who find it equally challenging to be ‘themselves’. The result? Two people engaging with what is essentially two false personas! Not a recipe for an enduring, successful relationship. Especially if it’s subconscious. Many of us feel that parts of us are ‘shameful’ and don’t want to reveal these hidden aspects, for fear that others will judge, condemn and ultimately leave us. The fear of abandonment (or its alter ego — engulfment) is a major subconscious and very conscious fear that invades and pollutes many adult relationships. Usually it’s based on past experience that has no present relevance. Yet like everything, if we focus on it enough, our fears become reality. A self-fulfilling prophecy which backs up our “I’m unlovable if I am truly my Self” mantra. Often we project the blame for our inability to be totally authentic on to the other person. We have an inner dialogue that says: “they won’t let me, or they won’t like me as I really am” therefore to keep this person I have to project my persona. One example at the ‘minor’ end of the scale is a former work colleague who was still throwing away the cup of tea her boyfriend made for her each morning, because she didn’t have the heart to tell him she didn’t like the way he made it. And they’d been co-habiting for a year! Self Identity – How Flexible Are You? Self Identity refers to an individual’s perception of “self” in relation to any number of characteristics, including but not limited to gender roles and sexuality, racial identity, career choice and many others. As humans we have a propensity to label everything – and that includes ourselves, even if we don’t always realise it! Why is self identity important? Because it isn’t fixed. As we grow and change through our life experiences and relationships, our self identity evolves too. But ironically, our self identity can feel like the anchor that is supposed to stop us from getting washed away in the flood of change… which is why some of the most difficult points in our lives can feel so painful – because we are unknowingly resisting a shift in our identity, or need to grieve for an identity we are leaving behind. Our self identity not only allows us to express ourselves as unique and individual, but also as belonging to and connecting with others who share certain aspects of our self identity. How can we explore it? What do I say when I’m asked to introduce myself in a work or a social setting? What labels or titles do I claim, either jokingly, or within a family/friends context? The more aware we are of our self identity and its significance, the more understanding we can be of our past and the more gently we might handle our next wave of self evolution. It might also help us be more flexible as we continue stepping closer to being the person we really want to be. 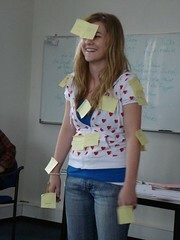 And for a bit of a laugh and some fun, have a look at some of the fabulous post-it note impressions on Flickr! Our beliefs are assumptions that we make – with conviction – about how things are and how they should be. We develop our beliefs from what we experience, see, read, feel and think about, and they are formed both by the objective facts and subjective stories we create to make sense of what we observe. This applies not only how we see ourselves but also how we see other people. What it takes to get the next promotion? What really impresses your boss? What the people you manage most value from you? Why your clients are ‘so demanding’? Managing your emails versus investing time in more high value, strategic initiatives? MOST OF US know that happiness really does come from within – not without. Our acquisitive culture has made us only too aware of the transient nature of short-term, external fixes. Like a Chinese meal, we’re all too often left hungry after feasting at the table of consumerism! And the secret of happiness? Change your thoughts. Nothing outside of you has the power to make you intrinsically happy. You can choose happiness, or you can choose to dwell on people and situations that bring you down. Ditto gratitude. When life takes you down, have a look around and acknowledge all the truly wonderful things you have to be thankful for. Roll around and luxuriate on the grass you’re on now. It’s not always greener the other side!